We offer the revolutionary CAST-110, a wave interference simulation system that simulates the signal jamming threats that occur in the real world, hostile environments. Operating in standalone mode or may be used as a supplement to a CAST simulator, this system allows users to test inside a chamber or test laboratory, ensuring the GPS/GNSS device meets the demands of the real world before being released to the market. Despite its usefulness and success over the past years, Global Navigation Satellite System (GNSS), especially GPS, has a weakness – its signals are an easy target for both intentional and unintentional interference. In fact, research has shown that GPS is one of the most vulnerable wireless data protocols out there due to the lack of authentication and encryption, and due to the growing popularity of stealth jamming and spoofing of signals. Only one strategically placed 1-Watt jammer with off-the-shelf parts can already disrupt the signals across an expanse of airspace. Intentional jammers could also disrupt both GPS and evade location, simply by using multiple low-power jamming devices on mobile platforms. The disruption of signals can lead to loss of timing or positioning accuracy, or even cease operations altogether. This is why industries that rely on satellite signals for high accuracy navigation need to test the resilience of their product. Fortunately, our CAST-110 interference generator offers a comprehensive solution for testing satellite navigation equipment, allowing systems to be tested with jammed signals before being released into the market. The CAST wave interference simulator allows testers to specify the initial position, signal transmission characteristics, and motion profiles for broadband and narrowband jammers. 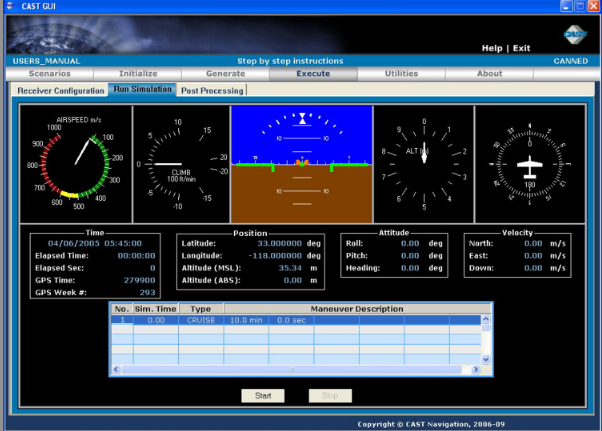 It can also record jamming-related navigation messages from the GPS receiver, including relevant jamming values, such as satellite Azimuth and Elevation, J/S rations, and even individual satellite pseudo ranges. This significantly simplifies the test report creation process. In addition, the system depicts a CAST simulator that comes with eight jamming generators – half of which are NoiseCom broadband generators, and the other half, Rohde & Schwarz narrowband generators. Overall CAST-110 for anti-jamming GPS receivers attenuates the signal, adds the thermal noise, the multipath, and the jammers, to disrupt the signal – and make testing scenarios as realistic as possible. This also allows testers to think about how to mitigate the risks and potential for attacks by not blindingly trusting the input. Make your navigation systems more resilient with the CAST-110. Call today for more information about this revolutionary product. 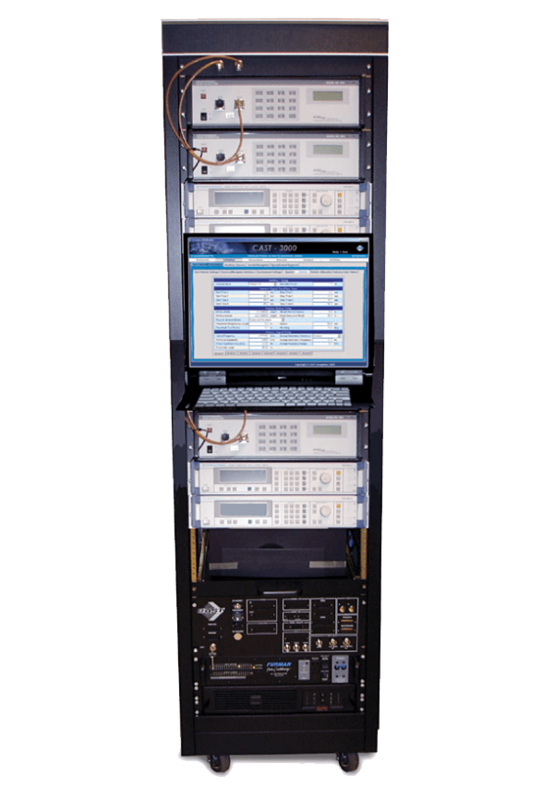 The CAST-110 interference generation system provides repeatable support for testing anti-jam performance of GPS receivers. The system enables the user to specify jamming levels and signal transmission characteristics for broadband and narrowband jammers. Modulation types on the interfering signal can be commanded dynamically. Jamming modes include Continuous Wave, Pulsed Continuous Wave, Swept Continuous Wave, FM Noise, Pulsed FM Noise, and Wideband Noise. CAST stand-alone interference systems are currently being used for U.S. military testing and operations. 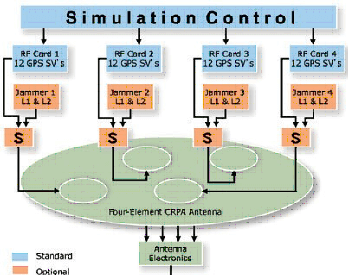 Up to eight independently controlled jamming signals can be generated simultaneously. Each interference source’s magnitude, frequency and type of modulation may be dynamically controlled. The user may manually adjust jammer levels and signal characteristics for each interference source in real-time. Broadband signals are optimized to deliver Gaussian amplitude distribution with adjustable power output levels.